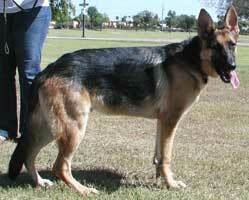 This 8 month old neutered puppy (2/1/08) is hankering for a real home. He's been an outside dog all of his life. Regardless of good intentions, the classic mistakes were made; daughter gave as a gift to Mom who is now living alone. 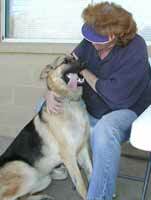 Mom knew nothing about the care and raising of a GSD puppy. To her credit, he had a few PetSmart puppy classes but no socializing, regular walks or training. He's a typical mouthy boy who must be transitioned to indoor living and the basics and social skills he missed out on. His evaluation is scheduled for the weekend of October 11th. Peanut is a classic example of an unsocialized, puppy; everything outside of his own turf is foreign to him all of which makes him want to head for the hills. We took thirty minutes before we could even move him away from his Mom..his only comfort zone. In a word; he is fearful. After giving him time to relax he seemed to welcome and rely upon the leadership he was experiencing, literally, for the first time in his life. Peanut is what we typically refer to as a "project dog"...he will require a new home with someone who has the time, patience and experience to start from scratch. He has lived his entire life outside, essentially as a 'lawn ornament'..Mom is gone 10-12 hours a day. He simply has no idea what is expected of him. He has no opportunity to channel his energy and nothing to stimulate his busy brain. He currently has no structure or routine in his life. Peanut was very responsive to corrections; once he was told that we don't play with our mouth on people, he was all kisses and apologies. We see dogs just like him blossom into wonderful companions, however, his humans must be willing to put the time and effort in that such progress will require. Other animals remain a question mark. It's a pretty safe bet that he will bark defensively until his social skills are developed. He has had no real training. Of course, once secure he's just a big lap dog. We were surprised when we saw some of his pedigree; if accurate, his sire is out of a kennel with which we are familiar..strictly West German Schutzund material! These are typically high drive, high strung lines. The potential is there, we just need the right person to tap into it. NO KIDS, cats are an unknown. 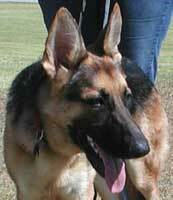 Another large breed female might work after slow and proper introductions. Peanut is neutered, chipped and current with vaccinations. Once filled out and muscled up, he will be a very handsome youngster. We would like to get hIm into a qualified foster home or foster-to-adopt situation so that we can start working with him. In the meantime, we hope that Mom can find the time to bring him out to Boot Camp. UPDATE 10/19: Peanut's Mom brought him out for his first dose of socialization today and what a difference a day makes! He was outgoing, friendly and approached all strangers without fear or hesitation. Unfortunately we got our wires crossed and Mom missed the opportunity to expose him to a bunch of other dogs. The good news is, she's going to make time to start him in a training class! Peanut did demonstrate a "wild child" mentality; he responds to people the same way he would another dog, never having been taught that we humans require less mouth contact...he is very mouthy. After a quick lesson in oh-no-young-man, we-don't-do-that his response to leadership was beautiful. He has a journey ahead of him but we're certain that at the end of that road we'll see a new and improved Peanut! UPDATE 11/3: Peanut has started training class and demonstrated that he is an out of control wild child. It's not his fault--he has a nice temperament--however, he's never been taught anything so he simply does not know what is expected of him. We've also learned that his current owner will be away from home for even longer periods than she is now so Peanut desperately needs an IMMEDIATE FOSTER HOME. He will require someone with some obedience experience and the patience needed to acclimate him to being a full time indoor dog in preparation for his forever home. If you are interested in fostering Peanut, please read about OUR FOSTER PROGRAM and submit a Foster Application (found on the Foster Program page). UPDATE 11/30: Peanut has made great strides now that he's been around other dogs and strangers. His Mom does walk him but only occasionally..every little bit helps. He's learning his basics too. It goes without saying that he needs training, exercise and activity more than just once a week (and he had to miss one class) so getting him into a foster home closer to us will enable us to work with him more frequently. He's come along so well that he's almost ready to meet his public. :UPDATE 12/7: Class ended last weekend and Peanut had only four sessions so we asked Mom to bring him to us this past Saturday so that a staff member could continue to work with him until class resumes after the holiday. We spent nearly two hours with him and he did very well, that is until we tried changing his collar; he was very afraid of it. Peanut will still have a minor tantrum when pushed into something he doesn't want to do and is easily handled by someone qualified. The problem is that his Mom has a fear of dogs in general, the result, we learned, of having been bitten years ago, so she's not the ideal person to demonstrate the leadership Peanut needs when he's home. If Peanut says "no, I won't" Mom says, "OK" and let's him have his way. Mom is working very hard at getting it right however, dogs sense when someone is tentative and become confused by that energy. We are trying to find an appropriate foster home so that Peanut can continue to progress at the rate we know he can. His "sit" and "down" is now solid, he's learning "stay" and has substantially improved walking in leash. He has done well with the other dogs in a class environment. He's not quite ready to be shown but he's definitely ready and eager to learn. Getting Peanut INSIDE is an immediate need. UPDATE 1/10: Our recalcitrant teenager is scheduled to be moved on Monday, Jan. 12th. He won't have all of the in-house freedom we would like but we just had to get him out of the yard and with a foster oozing with leadership, so it's off to Aunt Becki's. UPDATE 1/13: It was either euthanasia or us for Peanut, so we opted to take him on as a long term rehab. There's lots of work to be done but we're committed to the task. "PJ" as we now call him is learning to be comfortable away from his yard. His move was challenging because he was so frightened he switched into defense drive but once settled into his new digs, he's been a model citizen. We will periodically update his progress. UPDATE 1/14: We didn't expect to be doing any updates on PJ for quite a while but he's made such significant progress in such a short time that we thought it worth mentioning. PJ is a very sweet and loving creature but very much afraid of anything new to which he had not been previously exposed. When we did his initial evaluation he would not even approach a stranger for a long time. 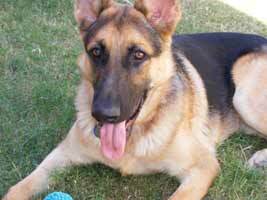 Now he's waggy, wiggly and oh so happy to make new friends right away; he will come right to nearly anyone who calls. He also had no bite inhibition whatsoever; he uses his tongue now instead of his teeth and we can actually see him stop himself from using his mouth even when a little scared. 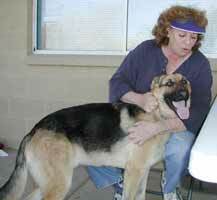 PJ has extreme neck sensitivity and it was impossible to get a collar on him, difficult at best to leash him. Today we took his collar off and while it required a great deal of time and patience, managed to get it back on with no nipping and no chasing. This exercise will be repeated over and over again as we desensitize him to all those things that used to make him lash out and from which he now just retreats until comfortable. None of this negates the fact that PJ will launch into defense drive when very frightened by something or forced beyond his threshold, which is not only dangerous but incredibly stressful for the dog; to him, his life is at stake and survival instinct takes over. To what extent we can alter this response remains to be seen. Yes, it will take a long time yet everyone who has met him loves him and he's building more confidence daily. UPDATE 7/28/09: We spent some long overdue time with the Peanut today; he's come a long way. He'll always be over the top behind a fence or in a crate but once out, all he wants to do is jump in your lap or play ball. He's quite the whirling dervish, hyper actually, and in constant motion. Becki has done a wonderful job desensitizing him..maybe it's because he remembers us but I could do or touch just about anything..no teeth, all licks. Our friend PJ was supposed to have started working with him but got pressed into fire fighting duty. Hopefully he will be in town and have time after fire season. It's time for Peanut to get out into the real, scary world... and he will. Currently not available for adoption.